On the run up to the final international week of this calendar year we present part two of Sandals for Goalposts’ analysis of the increasing influence of Qatar on continental and world football. In part one we looked at the highly impressive but controversial Aspire Academy, whose developments are pinned to national team success ahead of their home World Cup in 2022. But what of Qatar’s current side? Martin Lowe, Tom Danicek and Ahmed Hashim look at an improving squad that could well be in line for qualification for their first World Cup an edition earlier in 2018. Much of the furore circling Qatari football at present is concentrated on their home World Cup in 2022, with little in the way considered of their current status. Rather ignorantly western media has written off the Gulf nation’s footballing credibility, suggesting a lack of history and culture for the game. While they haven’t made a conscious impact on the mainstream football following world until recently, you can’t avoid the fact that they haven’t fared too badly at international under-age or senior continental competition. Their so-called lack of heritage is a story of near misses rather than any lack of interest. Since their foundation as a footballing nation in 1970, Qatar can boast a credible showing regionally, across Asia and even on an international platform at different stages in their development. Regionally they have reached the final of the Gulf Cup on six separate occasions (winning it twice), on the continent they’ve only just missed out on representing Asia at the World Cup in the 1990s on two occasions, while competing at finals at U17 and U19 level. On the World stage, they’ve clinched a U20 World Cup (1981) and qualified for two Olympic Games (1984, 1992), hardly a diminishing record for a country without a so-called footballing culture. While their successes as a country of minuscule stature have been impressive, the general theme that has dominated their history which rumbles through to this day is the process of nationalisation. It’s assumed that this has been a new phenomenon to boost Qatar’s chances in their upcoming home World Cup, yet, partly due to the limited size of the population and the continual wealth of the region, this has been common practice since the 1980s. The demographic has switched somewhat across the years, initially it focused on importing from neighbouring Gulf and Arab nations, before a greater South American focus in the 2000s, through to the present day where Africa is now in acute focus alongside various Arab diasporas within Europe. It will come as no surprise that the overseas recruitment hasn’t stopped at just the playing staff, but extended to the dugout. Since 1980 Qatar have had 31 separate coaches, of which only 3 were of Qatar nationality, the sole Asian recruits. The dominant nationality, which was mainly focussed between the years of 1980-2000, was Brazilian (14 in total), which as you can imagine in such a lengthy period has influenced immensely the footballing ideology of a nation which does differ significantly from their Gulf neighbours. This can be seen right through to the present day, as Qatar continue to produce plenty of attack minded midfield players and forward-thinking full backs, while struggling to either produce or accommodate deep lying “foot on the ball” specialist midfielders or out and out centre forwards, a positional dearth which is shared with Brazil. With this in mind the Qatari FA have been seen to take a number of directorial changes, implementing a broadly Spanish approach to development (through the Aspire Academy hierarchy), appointing Felix Sanchez as the U20 national team head coach and clinching the services of Xavi as a hybrid player-coach-ambassador to breed a new Catalan philosophy. Whether this directional shift is reactionary to a post-Guardiola/Barcelona/Spain football dominance or a focus on Qatar’s central midfield and possession weaknesses is up for debate, but national team fans continue to be unconvinced at the QFA’s priorities of looking outwards rather than inward towards what they already produce. While the FA continue to stress that their recruitment process of overseas nationals is improving results, the general public are steadily turning away. As recently as 2008, the national side could attract at least 10,000 for a home World Cup qualifier, nowadays they are lucky to find 2,000 attending. This can be correlated to the dwindling numbers attending domestic matches in the Qatar Stars League, which despite a clearly improved quality product on the pitch brought on by the vast amounts of money splashed on new signings, has lost plenty of admirers with the reduction of home players starring in the competition. It’s a case now of fans not having the same connection with either their local club side or the national team that they did some 20 years ago when the bulk of the members on the pitch hailed from Qatar. However, while numbers attending football has significantly decreased, interest in the game both domestically and the national team has continued to stay high behind the scenes, evidenced by constant television figures and social media interaction, which is quickly becoming more and more positive. The national team’s turn around in form over the last two years may be an indication that, despite their reservations over the national makeup of the squad, success on the pitch can breed success off it, even if the ticket receipts look to say otherwise. Another way to win over the fans is to limit the effect of foreigners on the national league. The QFA seeks to address those who remain concerned by ensuring that the 3+1 foreigner rule is properly followed in the QSL. 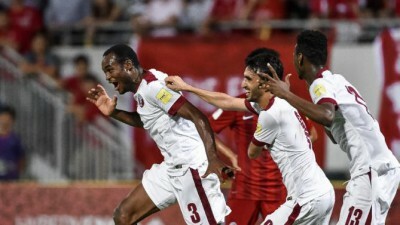 Previously the majority had tried and succeeded in circumventing the rule by naturalising their foreign imports; current Qatari champions Lekhwiya being the prime example. The QFA have realised an error in their ways and have focussed on preventing such cases by formulating tougher rulings. Recent legislation states that every QSL team must have a Qatari U23 player on the pitch at all times, a welcome amendment to the laws for many disgruntled domestic onlookers. While this has been a recent initiative, the balance between home born and recruited nationals remains in flux. A year on from Qatar’s most recent success, their Gulf Cup crown collected in Saudi Arabia last November, an analysis of those within the squads and those that actually feature is telling. Broadly the number of Qatari born internationals within the national team squad remains steady if not positively improving at two-thirds, a slight increase since late 2014. However, the proportion of overseas recruits is widely skewed when considering those who start in key matches. 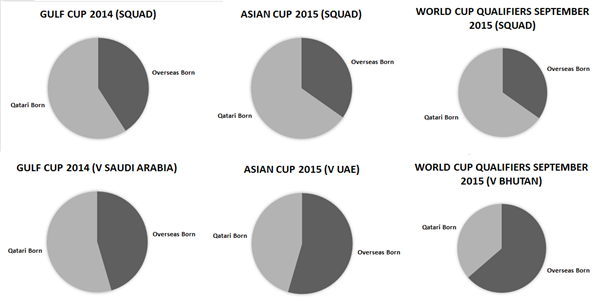 Under Djemal Belmadi at the Gulf Cup, for example, it was typical to have a 55-45 percentile split in favour of Qatari born players, however by January’s Asian Cup that percentile was mirrored back in the overseas born players favour. Since the appointment of Jose Daniel Carreno earlier in the year, while the squad demographic has stayed the same, only 4 of the 11 starting against Bhutan were born in Qatar. A damning upward trend that continues to peddle the notion that Qatar aren’t forthcoming in shrugging off their tendencies to rely on their highly paid recruits. It’s argued that overseas recruits are often fast-tracked to the first team with little focus on actual talent or form in the Qatar Stars League. One pertinent example has been that of striker Mohammed Muntari, who since his nationalisation ahead of the Asian Cup has become a mainstay in the starting line-up as a lone front man. While he has had the odd promising display, many argue his immediate call up and subsequent cemented status in the starting XI is unjustified, and that a home national wouldn’t have been afforded such security in the current setup. This is often thrown in the face of the QFA from the national fans who argue the national team are continuing down a road of overseas recruits over home grown talent. The latest story has been the pursuit of Al-Rayaan’s Rodrigo Tabata. Although a decent player who has a wealth of experience in the QSL, he clearly has his best days behind him at 34, leading many to question whether it’s right for a national team aiming to improve across arguably the most important 8 years in their footballing history to go after players who will be well into their 40s by the time of the 2022 World Cup. This moves onto a crucial question of priorities. Are Qatar preparing seriously for 2018 qualification, or are they focussing purely on 2022? The answer cryptically favours both as Qatar aim to develop two side-by-side squads. The first whose demographic has been outlined before is overseas recruit dependant, money driven, with a short-term outlook. And on the face of it they aren’t doing too badly, currently topping their qualification group ahead of the much fancied China, winning all 5 of their opening matches. The second is hoped, initially at least, to combine much of the successful U19 Asian Championship winning side of 2014 (that took their place at the recent U20 World Cup) with outgoing experienced “regulars” from the outgoing squad. However many have questioned whether when it comes to it, will the QFA prioritise success on the pitch over national football development, and revert back to their nationalisation tendencies? “Two trophies in three years we managed to win, but it (wasn’t) enough. The reason for my dismissal, only they (the QFA) know.” The high expectations of the federation are clearly weighing heavily in the dugout, once 2018 has gone, will the push for home born internationals persist if they continue to fall short ahead of 2022. The squad for now offers hope to appease their lofty ambitions. Since Carreno took the helm for World Cup qualification, his pursuit has gained plaudits as he slowly but surely introduces young talent. These include the repositioning of Qatari born and Aspire graduate Ahmed Yasser into a ball playing central defender, where he’s initially impressed, all be it against lower ranked opposition. Amongst his Aspire alumni, Akram Afif looks to be the pick on the next bunch coming through the ranks after picking up the odd squad appearance (and goal against Bhutan) in recent Qatar squads. But it’s been the continual utilisation of Boualem Khoukhi that is starting to define Carreno’s early time as boss. Khoukhi, a favourite of his predecessor Belmadi, has tended to blow hot and cold; hot being his winning goal to clinch the Gulf Cup against Saudi Arabia as an example, cold his insipid displays in Qatar’s doomed trip to Australia. Under Carreno he’s starting to find his previous form with 4 goals in 4 matches so far in qualifying but total admiration seems a way off with the supporter base, given that Khoukhi continues to embody the overseas recruitment argument after being poached from Algeria during his football development. Khoukhi does however offer a glimpse at not just a 2018 Qatar but a 2022 one. While hopes are high of the next generation of Aspire graduates, experience will still be needed to assist the team through a home tournament. Khoukhi by 2022 will be 32, and arguably the player in the best position to take over the mantle of Khalfan Ibrahim alongside another integral attacker Al-Sadd’s Hassan Al-Haydos. Qatar are far from a side in need of more recruits especially of the quality that continue be drafted straight into first team proceedings. For the time being clear question marks lie in the coming 12 months for Qatar. Firstly being how Qatar go about cementing their place in Round 3 of World Cup qualifying, can they look further to the young Aspire graduates or will reliance continue to depend on new nationalised recruits? Secondly, January’s U23 Asian Championship (incidentally hosted by Qatar) will see a great focus on the next generation expected to succeed not only in the forthcoming Rio Olympics but also in back to back World Cup campaigns to come. In front of a scrupulous FA hierarchy, it’s hard to pinpoint another nation in such a situation. Qatar are in a unique place where failure leads to their wealthy representatives to continually dig into their pockets for new signings rather than increased youth development. The pressure is already racking up on the playing staff as was highlighted by Qatar’s World Cup chief organiser; “The players know what an opportunity this is. I’m sure they won’t disappoint.” And we all know what will happen if they do, they can expect another highly paid recruit to take their place next time around. For the good of the game both in Qatar and in the region, the success of January’s U23 cohort of home-born Qataris is starting to look like a game changer in their footballing history.